2-1/8" diameter nylon tool gives leather smooth, finished edges. Works quickly and easily. We suggest that you use Gum Tragacanth #2620-01. Contact style for permanent adhesion. Don't be without this handy tape when lining up two pieces of leather for lacing, stitching or when using punches or chisels. Save time and eliminate the need for messy and smelly adhesives by using this extremely sticky, double-sided tape. Simply place in between the two layers of leather and begin your work immediately. Al Stohlman's name has always stood for the best in leathercraft. The 4-3/8" blade is stainless steel and polished to a mirror-like finish that helps it easily glide through thick leathers like saddle skirting. The unique engraving, solid brass bolster and hardwood handle makes this knife pieces of art. The handle is contoured to give you an easy, secure grip so you can work faster with complete control. 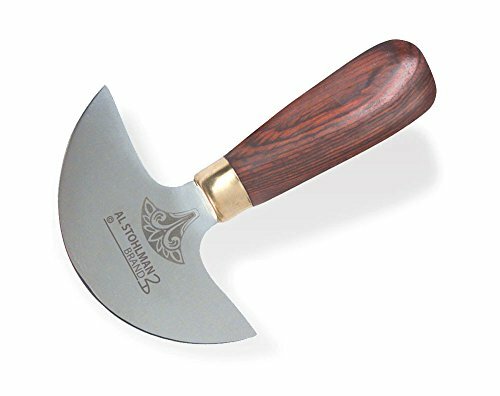 Head knives are one of the most versatile and most used tools for cutting and skiving of the thinnest to the heaviest of leathers. The head knife is also commonly referred to as a round knife. Once you have mastered this tool, you will wonder how you could have ever leathercrafted without it. Refer to Al Stohlman's Leathercraft Tools book #61960-00 for detailed instructions on the proper use of this amazing tool. Tandy Leather Eco-Flo Satin Shene 4.4 fl. oz. Eco-Flo Satin Shene is a water based, low V.O.C., durable, water repellent, acrylic non-glossy satin top finish for natural veg-tanned tooling leather.Directions for use: Shake well before each use. Leather should be clean and dry. Apply a light even coat of Satin Shene with a slightly damp sponge. Work in a circular motion, making sure finish gets into all cuts and impressions. Allow first coat to dry completely, and then apply a second light coat. After second coat has dried, surface may be buffed with a clean soft cloth or piece of sheep wool if a brighter shene is desired. Clean applicators immediately after use with soap and water. 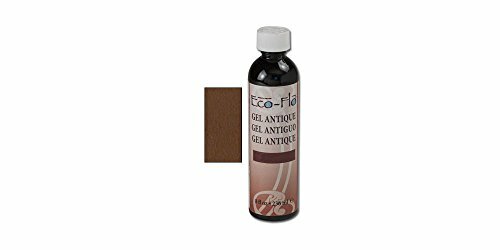 Tandy Leather Eco-Flo Gel Antique 8 oz Med. Eco-Flo Gel Antique is a thick, easy to use water based, low V.O.C., antique for veg-tan tooling leather. Flip top squeeze container makes application a breeze and almost mess free. Directions for use: Apply a liberal amount of antique to a dry, soft cloth. Work into leather, rubbing briskly in a circular (small circles) motion until surface has an overall, even color. Remove excess immediately with a clean, soft cloth. Continue rubbing until surface achieves a mellow gloss. Allow to dry completely. Apply Carnauba Creme, Super Shene or Satin Shene finish for a final seal.NOTE: Some finishes may pickup a small amount of color. Tandy Leather Eco-Flo Gel Antique 8 oz Dk. Eco-Flo Gel Antique is a thick, easy to use water based, low V.O.C., antique for veg-tan tooling leather. Flip top squeeze container makes application a breeze and almost mess free. Directions for use: Apply a liberal amount of antique to a dry, soft cloth. Work into leather, rubbing briskly in a circular (small circles) motion until surface has an overall, even color. Remove excess immediately with a clean, soft cloth. Continue rubbing until surface achieves a mellow gloss. Allow to dry completely. Apply Carnauba Cr�me, Super Shene or Satin Shene finish for a final seal.NOTE: Some finishes may pickup a small amount of color. Tandy Leather Eco-Flo Super Shene 4 oz. Copyright © Wholesalion.com 2019 - The Best Prices On Tandy Leather Works Online.